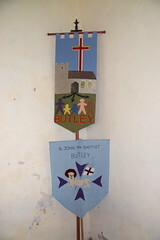 Butley is a fascinating village. The familiar part sits on the top road, and runs more or less on into Chillesford. 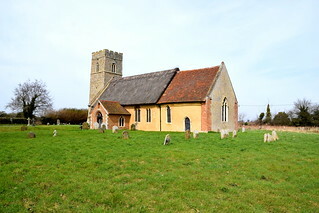 Part of the village here is actually in Wantisden parish. On the creek below is the less well-known Butley Mills, a collection of 19th century buildings. A road leading off the high street is lined with rural council houses, a reminder that this is a working village. It climbs into the woods, where you'll find the remarkable Butley Priory Gatehouse, probably the finest surviving medieval gatehouse in England. It looks like the west end of a cathedral dropped off, its remarkable flushwork the setting for a bewildering array of shields. It is now a private house, but open sometimes for concerts and the like. 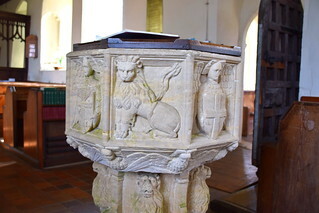 In comparison with such richness, St John the Baptist is rather homely, a simple Suffolk parish church not so very different from a hundred others. 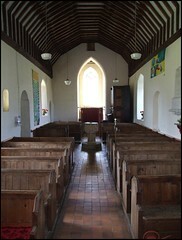 Like many, the nave was more or less the original Norman church. 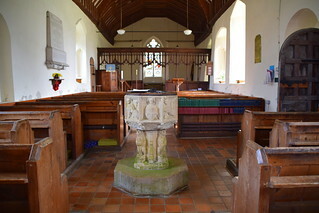 The chancel was added and the tower done up in the 14th century. 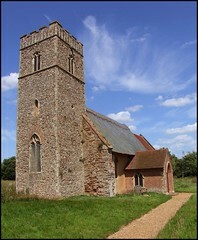 From the south, it is a lovely sight, mainly because of the way its thatched roof and elegant porch combine. A path leads through from the south-west corner of the wild graveyard, and you step through an ancient, beautiful doorway. 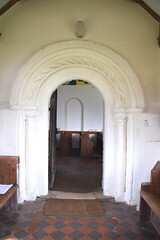 The porch itself is a fine Tudor red brick one, and you then step through another, even older doorway, the Norman doorway of about 1150. The door is at least as old as the porch, and may even be as old as the doorway. That it is old enough to have needed repairs becomes obvious once you are inside the church, for on the inside of this door is a fascinating piece of social history. 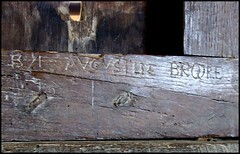 The date 1571 is inscribed, and beside it the name Augustine Brooke, the letters carved about 4 feet from the floor. 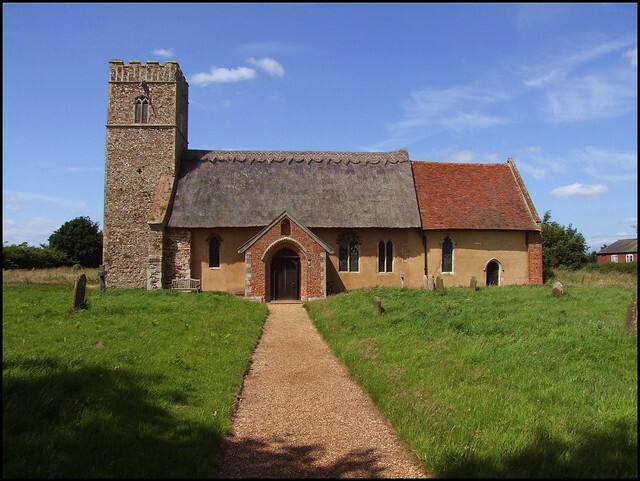 Sam Mortlock notes that this name can be traced in the records of nearby Butley Priory, as that of a child taught there in 1538. It is fascinating to think that this man grew up on both sides of the Reformation divide, perhaps to become a churchwarden and to set his name against a repair. Internally, this wall on the south side shows its great age, especially towards the west. It is not a wall you'd want to have to hang a picture on. The soft ground of the heathland, and the coastal winter storms of half a millennium, have left their impress. Curiously, right at the west end is a doorway into a stairway. Where did it go? 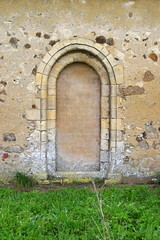 When you look at the outside of the west wall from the churchyard, the faint outline of another doorway can be seen in the brickwork. 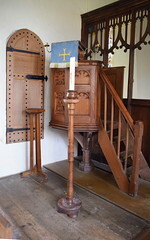 But what purpose had a doorway at a height of about 25ft leading to the outside? Perhaps it had led to a wooden stage which would give access to the tower - although, of course, it may well be even older than the tower. 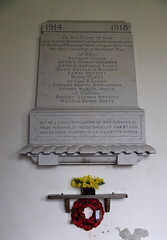 On the north side of the nave, the war memorial is by Munro Cautley, who was diocesan architect at the time. The rood screen is original 15th century work, but totally tamed by the sanding and varnishing of the centuries. 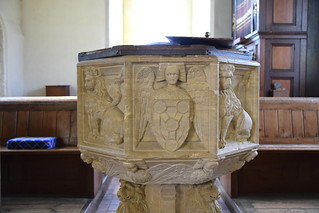 The font is very well preserved, suspiciously so, and I think that the bowl, at least, may have been recut. 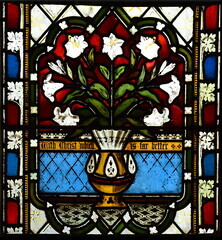 One of the shields bears the symbol of the Holy Trinity. 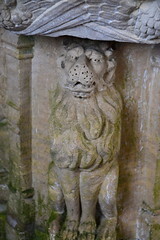 This symbol seems to have often survived the iconoclasts of the 16th and 17th centuries, perhaps because they didn't understand it, and thought it heraldic. 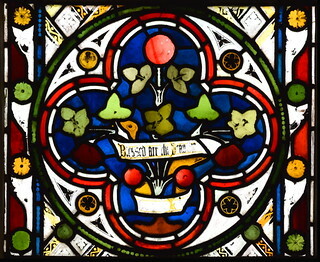 The Anglican reformers in particular left heraldic imagery alone, realising the role it played in keeping the local ordinary people in their place. Visiting in April 2018, I found a retired couple sitting outside the church beside their electric bikes, enjoying a cup of coffee from a flask in the early spring sunshine. They didn't speak much English, but it turned out that they were Dutch, and they came to Suffolk each spring to cycle around the countryside. They told me that they liked East Anglia very much, and I told them that I liked Holland too. European friendship signalled and sealed, I bid them farewell, got back on my bike and headed on to Chillesford.